Order any non folded digitally printed leaflets or flyers before 1pm on any working weekday and your order will be delivered on the following working day to any UK mainland address. Please Note: Some Scottish Highland addresses are a two working day service. If you require shorter print runs but full colour is still important then our full colour digital leaflet printing service is the answer. Our digital press is networked to our pdf workflow and is used to print small to medium quantities of digital leaflets requiring a fast turnaround. Our digital leaflet printing is normally ready for dispatch within 24 hours of ordering. Being 100% digital means that there are no printing plates needed making it cheaper on smaller quantities of leaflets. An added advantage of this is that you can produce shorter and more frequent print runs giving you the opportunity of making changes. Our standard digital full colour leaflets are printed on 170gsm paper. If you already have artwork or a layout that you need to be transformed to print, you can count on our services to do them fast and fit to your budget. 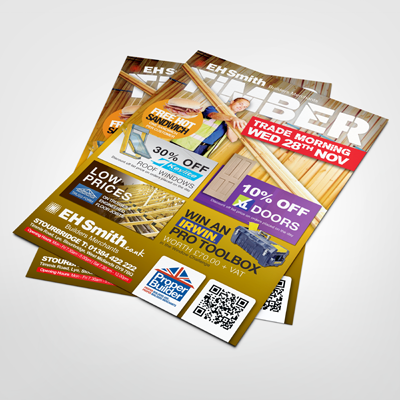 Send a PDF file of the leaflet artwork for both sides with the right specifications for the A4 leaflets. Once we have received your artwork, we check that it is ready for printing immediately. Our printing process is fast, energy efficient and we aim to minimise our carbon footprints as much as possible. Once everything has been printed to perfection, it is ready for packaging and dispatch, and delivered straight to your business address. Prices are from supplied print ready .pdf and are plus VAT where applicable. See our artwork guidelines for more information on supplying pdf files. For general advertising, charity organisations and many other businesses that aim to provoke the visual, text and emotional aspects of their target markets, one of the most common yet effective means to provide information is through a Next Day A4 Leaflet. It is a single piece of high quality paper that has been printed professionally to create an interesting marketing tool. A4 Leaflets are still very useful tools to inform people about various things. It could be an awareness campaign, a call for action of commercial reasons. Nonetheless, if you are in need of high quality leaflets, do not hesitate to take advantage of our Next Day A4 Leaflets. Some say conventional advertising is not relevant anymore but no one can deny the effectiveness of Next Day A4 leaflets to provide information, effective marketing strategy and a great look for your business or cause. If you have any queries about our printing services, do not hesitate to call or email us. Check our site to find out more about prices and shipping details. At Quadrant Print, we've got you covered in all your digital and litho printing needs for your business.